Age Limit (as on 01.07.2017): 18 to 40 years. Between 18 to 40 years as on 01-07-2017 for recruitment to the post of MPEOs in the Department for this recruitment only. The age relaxation of 5 years for SC, ST and B.C. and 10 years for Ex-Servicemen candidates are allowed as per Rule-12 of A.P.S.&S.S. Rules,1996. Recruitment to the posts of MPEOs shall be considered with the following qualification. *The selection among the applicants will be made in the following order of preference. Category-I: B.Sc (Ag), B.Sc (Horti) and B.Sc (Dry Land Agriculture). Category-II: Agricultural Polytechnic Diploma Holders, Diploma in Seed Technology/ Plant Protection/ Organic Farming (Recognized by ANGRAU). Category-IV: Science Graduates with specializing in Botany. District and should produce the Study Certificates accordingly. Selection Process: Selection procedure will be 80% merit (Education qualification) and 20% on interview basis. 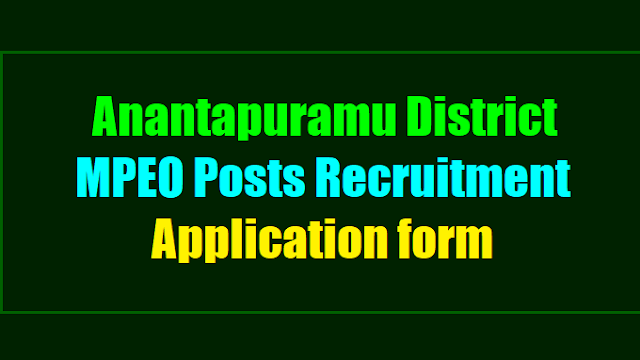 How to Apply: Candidates should submit their application along with the relevant attested copies of certificates on or before 22.11.2017 to the Joint Director of Agriculture, Behind Pennar Bhavan, Opp: APCO Bhavan, Ananthapuramu. Any application received without enclosing relevant certificates will be treated as invalid and liable for rejection. Last date for receipt of application: 22.11.2017.